It is late afternoon, perhaps a few minutes to or past three, and I'm in Rabat, making my way back up an incline and heading towards the Domus Romana, where I'm hoping to meet Jeanine. I wait a couple of minutes in front of the gate before I get a glimpse of her. I wave and Ganna, as her friends affectionately call her, walks slowly in my direction. We say our hellos and walk back down the slope which leads to the Stazzjon: an old building which used to be a railway station, now restored and serving as a restaurant. 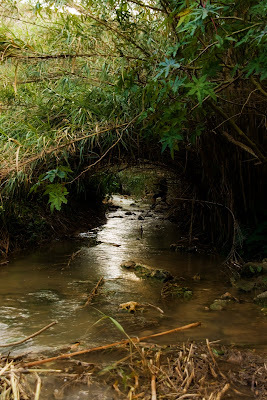 We cross the brigde and head to Mtarfa - it has rained heavily lately and we are sure to find Malta's man-made reservoir full to the brim both with water and with life. We finally make it down the slope. The grounds are packed with parked cars and people who have come to make the most of the rainfall, and we are in fact immediately gratified as one of the dams is steadily overflowing with water. Apparently, Malta is home to all things little: from dwarf elephants to dwarf waterfalls. Chadwick Lakes consists of a series of dams built by Sir Osbert Chadwick, a British engineer, in the late 19th Century and located in Wied il-Qliegħa, a valley near Mtarfa. It is in fact a complex system of well-planned dams, stretching from the North West of Malta, draining into Wied Speranza and finally ending in the sea at Salina Bay. The place provides farmers with a means to irrigate their land but calling it a reservoir could be a little misleading since in actual fact the water is eventually lost to the sea, and so Chadwick Lakes is only full during winter and spring, and only when it proves to be a rainy season. Chadwicks Lakes serves another purpose: it is Malta's only freshwater stream big enough to be called a rivulet, providing a beautiful environment unique to this part of Malta for the populace to enjoy. But as always appearances can be deceiving: this innocent, little, man-made water reservoir, a place for small children to run along and give vent to their restless nature, has proved deadly this weekend, taking the life of a young Maltese soldier who drowned in the small pools which can reach a depth of 2 metres. A tragic end in such a tranquil place. There is no solemnity in the air today however, and there is nothing gloomy or sombre about this beautiful, warm, sunny day either. People have come in throngs: undoubtedly some came here to satisfy their curiosity, perhaps thinking they can do a better job than the police and shed light on the case thanks to some improvised detective work, but most are here simply to enjoy a beautiful consequence of heavy rainfall. As Robert Frost, the famous American poet, once put it, all we know about life can be summed in three words: "It goes on." As we start our walk we immediately notice the natural segregation: couples walk hand-in-hand on the smoother paths, still possessed by the artificial (and perhaps superficial) warmth of the day of lovers; younger children and adventurous souls take a somewhat rougher route, hopping briskly on the muddy paths, while old folk who have come to relax stay behind and establish themselves in the open spaces, comfortably seated with a cup of coffee in hand, content to enjoy the scenery and take in the fresh air. Even though it might not be one of the most beautiful spots on earth, the place does convey an aura of relaxation, with the Maltese sun shining gently on the flowing water, which trickles down constantly producing a very soothing sound. Taking a look around, I can't help but recall the day when I used to come here, armed with my huge Italian dictionary, to read La ragazza di Bube, a great novel by Carlo Cassola. Chadwick Lakes is a place that invites relaxation, and anyone visiting after a downpour can easily be lulled into a state of mellow sleepiness by the mesmerizing sound of flowing water. And yet both Ganna and I feel a strong urge to explore, and we resist the temptation to lie back and relax. Walking along the path we admire the lush greenery surrounding us until we eventually come to a small fork where we have to make a choice: either we continue straight ahead or we descend a couple of metres and walk by the small stream. Opting for the latter, we begin descending the small slope and as soon as we make our way down we notice a nice tunnel lying straight ahead of us, so I stop to take a picture. It is all very magical down here, and it is so cut off from the rest of the place, with the area being so well isolated from the smallness of the whole, that one can easily imagine a vastness of space. We walk a couple of metres and we find a small stream crossing. Ganna tries to find a way around; an alternative route which is less wet and has more ground. She hopelessly tries to convince me that there is probably another, drier way nearby. A few seconds later she divulges her discovery of a small passageway, but I am already tackling the stream and halfway through. Ganna doesn't feel very comfortable about crossing the small stream, and she points out that she's wearing jeans, which are not ideal for manoeuvering, and fears she'll get wet. But all she needs is a word of encouragement and presently she is expertly hopping from one rock to another. She reaches out for my hand and I pull her across, whereupon she triumphantly leads the way. After walking a few feet we are faced once again with another crossing. This time the rocks do not look so sturdy and in fact a quick testing reveals their rocky nature. We use a stick to rest upon and maintain our balance; it provides rigid support as we eventually make it through to the other side. But we are soon faced with another obstacle only a couple of feet ahead. We have reached muddy ground and our path is blocked by a knee-deep pond, which a group of teens wearing Wellingtons easily wade through. Our footwear is hardly suited for the job: I am wearing hiking boots and Jeanine is wearing trainers, so traversing the pool is out of the question. We try some lateral thinking and end up choosing a lateral way, deciding to proceed slowly on the narrow muddy side-path, our backs against the rubble wall. Our progress is soon halted as piles of natural debris stop short our walk, forcing us to find another way out in order to overcome the impasse. Turning back is an option but instead I suggest we climb the rubble wall, and Jeanine welcomes the idea. I pull myself up and Ganna follows suit. We slowly make our way back on the ledge of the rubber wall, taking care not to fall down. The golden hour has started and everything is magically bathed in a warm yellow light. On the way back we stop to admire and photograph a charming scene. 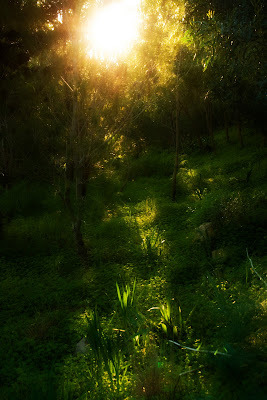 Tree tops are bathed in warm sunlight and a ray of light makes its way through the branches, sprinking its golden hue over the fresh, green grass, creating an almost mystical sight. It only lasts a few minutes: a few intensely magical and enchanting moments. Making our way back we feel as if walking through a golden forest, with all our surroundings bathed in this golden light and everything - the trees, the flowers, the grass, the young joyful faces of children skipping playfully hither and tither and the ground itself - taking on an orangy hue. Even the clouds reflect the warm light and each one looks like a big puffy orange sponge. Photo Adventurist who, surprisingly, likes to go on adventures and take photos.